I've spent the past couple of weeks learning Plastic SCM, and now I'd like to share some of what I've learned. Codice makes a big deal of "task-based development" and a "branch per task" approach, so that's one of the areas I focused on. Since Codice doesn't have its own issue-tracking system (ITS), this approach can work only if Plastic SCM plays well with existing, popular ITSs. And since this sort of thing is pretty complex, I was hoping to find some juicy bugs -- one of a tech writer's greatest joys! I took a look at Codice's list of ITS integrations, currently eight of them, and decided that Trac was in my comfort zone. This open-source ITS is built in Python, which I've used a lot over the past decade. (The Codice guys seem to be into Ruby for scripting, but I forgive them.) So I fired up my Windows 7 laptop, an HP Pavilion dv7, and jumped in. Plastic SCM (www.codicesoftware.com) – the new Community Edition is free, forever, for up to 15 users. Python module distutils (pypi.python.org/pypi/setuptools) -- this module includes a very useful executable, easy_install.exe. Whoa – what's Subversion doing on that list? It turns out that the XML-RPC plugin code is stored in a Subversion repository -- go figure! I installed Plastic SCM in the standard way, into the standard location C:\Program Files\PlasticSCM. I installed Python in the standard way, into the standard location C:\Python26. I installed Python's distutils 0.6 module using the wizard in setuptools-0.6c11.win32-py2.6.exe. This places easy_install.exe in folder C:\Python26\Scripts. As with distutils programs, Trac programs get placed in folder C:\Python26\Scripts. It was a bit too soon to install the Trac XML-RPC plugin at this point, so I didn't. A little massaging of the Trac environment is required first. With both the SCM and ITS systems installed, I set up some data to be used by their integration. Chances are you're like me: more familiar with Plastic SCM than with Trac. So I'll gloss over the Plastic SCM details and spend more time on the Trac details. Then, I created some Trac issue records, called "tickets". 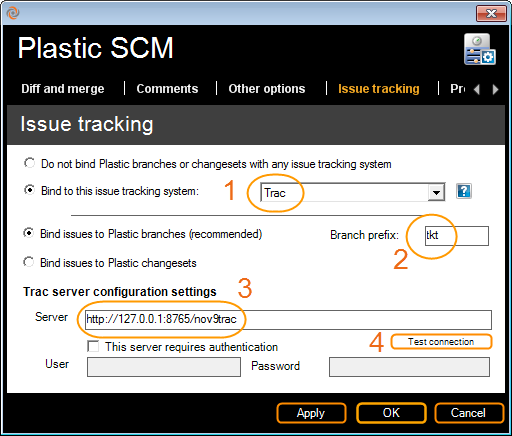 When a particular branch is selected in the BranchExplorer, Plastic SCM makes a remote procedure call (RPC) to the Trac server. The server returns field values from the Trac ticket that is associated with the branch. Each Plastic SCM branch is associated with a Trac ticket, and each Trac ticket represents an engineering task. Et voila (or the Spanish equivalent), "branch per task" is a reality. 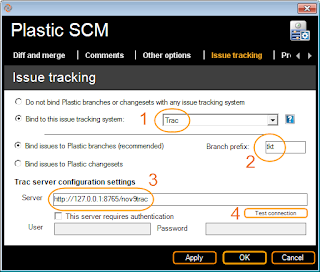 In the Issue Tracking dialog, I (1) selected Trac as the issue tracking system; (2) specified a branch prefix, establishing the protocol that all Plastic SCM branches with names of the form tktNNN are to be linked with Trac ticket NNN; and (3) specified the URL of the Trac server – the same URL I used when creating the Trac tickets. To make sure that I'd done my work correctly, I (4) clicked the Test Connection button (and held my breath). It worked the very first time – no kidding! Finally, it was time to test the integration between the Plastic SCM and Trac issue tracking systems! Using the BranchExplorer, I created a subbranch of /main, naming it tkt0011. (Would those leading zeros cause a problem?) 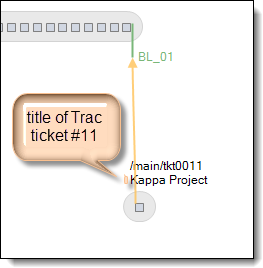 I refreshed the BranchExplorer display, and sure enough – the new subbranch was annotated with the title of Trac ticket #11: Kappa Project. That's the integration – simple to set up and simple to use! I know what you're thinking: did I find any bugs in this facility? Sure I did! If Trac's Web server is not running, trying to launch the BranchExplorer causes the Plastic SCM GUI to hang. 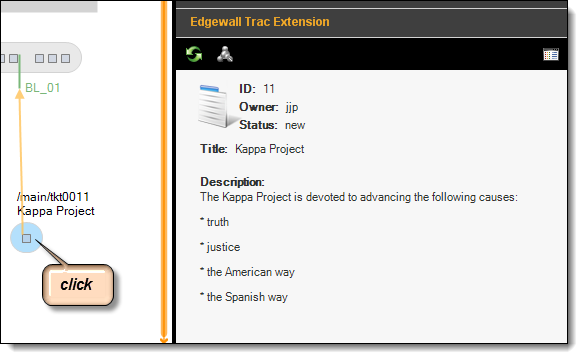 I also thought of an enhancement: when looking at a ticket, the Trac user should be able to see what files have been created/changed for that task. It should be easy to implement, since it's just the set of revisions created on a particular Plastic SCM branch. That's one of the beauties of a branch-per-task approach. I'll try to get the Codice guys to address both these items. Bye for now!